Please join Lama Mark in November 2018 for 12 days of teachings on Abhidhamma (Sanskrit, Abhidharma). The Abhidhamma “Higher Laws” or “Higher Phenomena” is one of the three collections of the Buddha’s teachings. Abhidhamma is a profound study and series of meditative investigations into: mind and form; mental states; meditative concentration; realms of being; mental processes and cognition; stages of liberation; emptiness; interdependent origination; and the causality/emptiness teaching of the interdependence of all phenomena (paṭiccasamuppāda, & paṭṭhāna). The emphasis of this course will be on learning to use the Abhidhamma to unfold deeper wisdom understandings through reflection and meditation into the nature of self and phenomena. There will be less focus on Abhidhamma as a Buddhist philosophy and more focus on the entire scope of the Buddha’s teachings, especially the step by step process of unfolding insight wisdom. Lama Mark will give many explanations and examples from modern cognitive, neuroscience, life sciences, ecology, physics, chemistry and cosmology perspectives. Additionally, he will make connections to Bodhicitta and Vajrayana practices. As the Abhidhamma is a contemplative framework of the Buddha’s entire teaching, during each class Lama Mark shows how the text is used for meditation and how it fits into meditation traditions and all of the Buddha’s teachings. Lama Mark often pauses to lead participants through examples of contemplation and meditation based on the specific themes or statements being taught. Many of the South Asian retreat masters of the modern Vipassana movement had a deep grounding in Abhidhamma, including one of its 19th century founders, Ledi Sayadaw of Burma. Great Dzogchen and Mahamudra masters such as Jamgon Mipham Rinpoche studied Abhidhamma and wrote a treatise on it. Abhidhamma is a most compassionate study and practice for training in the wisdom level of causality and emptiness. And it gives some of the highest teachings and trainings in interconnectivity ever described. Thursday Nov. 8: evening class @ 7pm. Overview of the Abhidharma tradition, teachings and meditations. @ the Drikung Centre, Fleischmarkt 16, 1st floor in Vienna. Friday to Sunday 9th-11th: 3 session per day—morning class at 9:30-11:30am, afternoon group discussion and review session at 3-4:30pm, evening class at 7pm-9pm. November 15 to 22nd: 3 session per day—morning class at 9:30-11:30am, group discussion and review session at 3-4:30pm, evening class at 7pm-9pm. The principle text used will be: Bhikkhu Bodhi, transl. (2000), A Comprehensive Manual of Abhidhamma, a translation of the Abhidhammattha Sangaha (Manual of Abhidhamma), by Ācariya Anuruddha. Buddhist Publication Text Society. Please purchase the printed book. Supplementary handouts will be printed as needed. And please bring a note book. There will be opportunities for interviews with the teacher. No one attending will be turned away for lack of funds. Lama Mark (Lama Yongdu Chokyi Gyaltsen) has been studying and teaching Buddha-dharma for over forty years. For thirty years his main root teacher was the great Ven. Karma Tenzin Namgyal Rinpoche who taught and led retreats in all three cycles of the Buddha’s teachings, including Abhidhamma, Vipassana in the lineage of Mahāsi Sayādaw, generation and completion stage practices of the Tantrayāna and Mahamudra/Dzogchen of many lineages, especially of the Karma Kagyu and Sakya. In 1975 during a three month retreat and transmission of Abhidhamma, Lama Mark was instructed by his Lama to start teaching Abhidhamma to Rinpoche’s students. Lama Mark has taught many Abhidhamma/vipassana meditation courses over the ensuing years, including a full four month transmission with detailed commentary and a month’s retreat in 2010. More recently under the guidance, requests and transmissions of Drikung Lho Ontul Rinpoche, Lama Mark has been teaching principally the richness of the Drikung Mahamudra and Drikung Yangzab Dzogchen traditions. His compassionate activities demonstrate a profound commitment to freeing beings from innumerable suffering states. Lama Mark’s emphasis with practitioners and students is on uncovering pure Dharma to reveal its extraordinary benefits and share the great joy of its deep study, meditative practices and integration into all aspects of our lives. 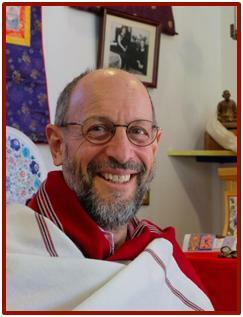 In addition to establishing Namgyal Choling Gompa on Galiano Island, Canada, Lama Mark is a resident teacher and spiritual director for a number of retreat centres around the world.